An ever-popular activity! 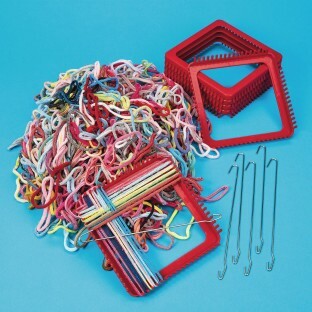 Perfect for groups, this loop and loom pack is great for making bracelets, potholders and much more. Includes a 16 ounce bag of loopers (enough for approximately 16 potholders), 6 plastic frames (7" square) and 6 metal hooks (9 1/4" long). Loops are a blend of synthetic fibers in assorted colors.